Huge investment bank Goldman Sachs has declared the renewable energy sector to be one of the most compelling and attractive to invest in, RenewEconomy has reported. The bank is apparently putting its money where its mouth is with planned and already invested funds of $US40 billion. Goldman Sachs has already made some large investments in the sector, including a $1.5 billion investment in Danish offshore wind energy developer Dong Energy. The bank has also invested in solar company BrightSource Energy, and provided $500 million in finance to U.S. solar services company SolarCity, which went public in late 2012. Goldman Sachs was also an early investor in the biggest U.S. solar panel manufacturer, First Solar, as well as in pioneering solar leasing company SundEdison. The giant investment bank has set up a new electricity producer in Japan called Japan Renewable Energy (JRE), which will develop and run solar, wind, and other renewable energy projects. 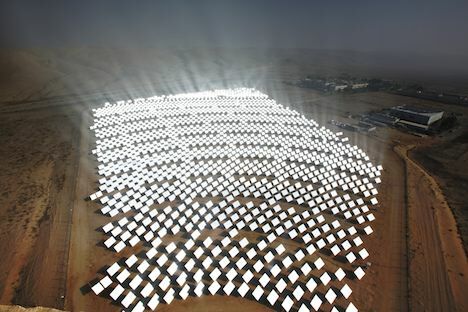 Over $3 billion is being contributed for this, with 2 large-scale solar projects already planned. Along with many others familiar with the solar industry, Goldman Sachs is expecting that costs of solar will continue to drop as efficiency improves, and that before long solar power will be very competitive with conventional sources of electricity in many parts of the world– without subsidies. It is also expecting renewable energy storage problems to be largely solved in coming years.